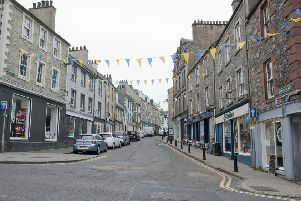 A police raid at a Hawick house led to cocaine and cannabis being seized, Jedburgh Sheriff Court has been told. Officers were granted a search warrant for Kelvin Clamp’s home in the town’s Loan on September 7. During the ensuing search, they found cocaine valued at £300 in pillow-cases, and Clamp’s partner Shirley Page, 38, admitted it belonged to her. Two cannabis reefers with a value of £2 were found in a bedroom cabinet, and Clamp, 32, admitted they belonged to him. Clamp’s lawyer said his client smoked reefers to help him relax. The solicitor representing Page, of Borthaugh Road, Hawick, said she’d had a good work history as a carer for the elderly but had had to give up her job two years ago due to a downturn in her mental health. Page said she had decided to buy cocaine in a bid to alleviate symptoms of depression. Page pleaded guilty to possession of cocaine, and Clamp admitted a cannabis possession charge. Sheriff Peter Paterson said that though only a small amount of cannabis was involved, Clamp had previous convictions so he fined him £60. He fined her £200 but warned her she would not get away with a fine if she appears in court again on similar charges.